As parents, we all want to raise our children as emotionally and intellectually healthy people. Children learn through creative play and so parental nurturing comes in handy in satisfying their general curiosity, providing motivation to pursue their interests and ambitions in life. Parents often expose their child to new things to expand their interests. While most kids tend to be increasingly curious and explorative, some do exhibit artistic and cognitive giftedness in their early development. The world has long been fascinated by prodigies--gifted kids whose creative talent, intellect and creativity make them stand out among the rest. "A gifted child can be expected to learn faster than other children, have more varied interests, have greater depth of feeling and generally be more than other children," explains Dra. Leticia Penano-Ho, President of the Philippine Center for Gifted Education. The now grown-up gifted trio of the Wyeth TV ad (Kiko Galura, James Flores and Shaira Luna) in the 1990's shares how invaluable their parents' nurturing role and proper nutrition played on their professional successes. Following the success of the Gifted Alumni, Promil Pre-School continues on with its campaign towards supporting giftedness in children. 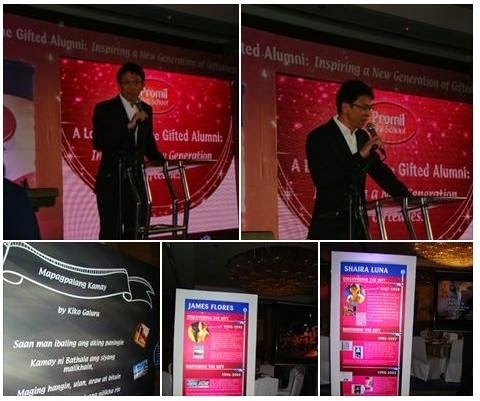 With the launching of Promil Pre-School's Gifted Movement campaign that celebrates giftedness in the Philippines, it aims to spark interest and gain the commitment of consumers to take an active role in advocating giftedness and nurturing it. Parents should not only ensure that they are developing their child’s talent and maximizing his potentials, parents should also nurture also emotional intelligence in order to successfully raise a gifted kid. Parents' assistance in nurturing emotional intelligence alongside intellectual giftedness will produce a confident, self-assured adult who is capable of being productive and very highly successful with later life. One only needs to look at how Gifted Alumni Kiko Galura, James Flores and Shaira Luna grew up to become the well-rounded individuals they are today as a testament to this. Joey Ayala gave a testimony on how his parents provided him with enriched environment to develop his musical inclinations and artistry. He later on jammed with the Promil PreSchool prodigies James Flores and Karl, much to the audience's delight.